Hi! I have been feeding my chow kibble ever since and I'm thinking about giving her raw meaty bones. I heard that it's good for their teeth and basically is the only thing needed to keep it clean naturally. I just wanted to get opinions if anyone is mixing in raw meaty bones once in a while for the same reason. Any feedbacks would be much appreciated! The bones and kibble will scrub teeth to a certain degree, but not completely effective. Honestly, you will need to brush her teeth just as you do your own...maybe not as often though. This is really important as you dont want to develop a situation with bad teeth. Believe it or not, the range of issues can be quite severe. At minimum, a case of really bad breath. Advance that to a case of loosing teeth, or at worst case, infections in the tooth roots that can spread into the spinal cord. The choices at tooth cleaning are also varied. 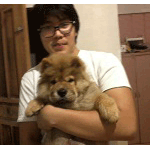 If as a pup you have tought your Chow to be accepting, you can do it yourself. Since our dogs are involved in shows, they are very comfortable being touched and prodded. This started with their puppy training. This is actually easier for us than nail trims (for us, not the dogs, we are just are nervous about clipping). Most groomers will perform this service as part of a visit. Sometimes dogs are more accepting of the environment and being outside their normal comfort zone. For extreme cases, a complete cleaning can be performed by your vet under sedation. I bought a pet toothpaste from my vet and we brush his teeth when we give him a bath..
My Sheena, a street rescue at 3.5 years old, has yearly checkups at the vet. I had her teeth cleaned professionally at 3.5 years, 6 years and then at 12.25 years young under isoflurane gas anesthesia only. I brushed her teeth sometimes but found getting to her back teeth were difficult. I would check for teeth movement with my fingers to check for anything cracked. I cannot stress enough the importance of professional dental cleanings, especially with chow-chows or any other dog with high melanin pigmentation on their tongues or skin, especially when they get to adulthood. Only under anesthesia would this melanoma been caught as far back in the tongue as it was and I wouldn’t have had a chance to extend Sheena’s life. Sheena is doing well, hops like a bunny to greet me and sniffs bags to see if I brought home any goodies and is back to the demanding poochie that she is. She has less weakness in her hind legs, can get up by herself now and the neurologist states the problem with her hind paw is neurological so I sometimes need to turn her paw so she can push herself up. I never knew about oral melanoma being common in chow-chows and being 30-40% most common tumors in diagnosed tumors in a canines mouth. Average age is 11 years but then some chows have gotten it at 9 years. Much health and early discovery of any problems in your chow-chow(s). Good to know Sheena is doing well right now. I believe everyone would love to keep their fury family member forever but a few more years with us would definitely be a blessing that every chow parent would want. I will definitely take your advice to heart and schedule a dental cleaning maybe bi-annually or so (hopefully it doesn't cost that much). Let's treasure every minute we spend with our love ones and make sure to let them know how much we love them. Cheerios! Every person today desire for shiny and white teeth, but only few of them do effort in doing so. It is very necessary that one should take care of proper clean teeth in order to get white teeth. Everyone wants a beautiful white smile and for this reason people start using different type of teeth whitening products available in the market today. There are many home remedies too and you have also shared effective tips with us for teeth whitening. I am not advertiser for this site.Once i have a dental problem then i contact them.By their helpful and appropriate treatment recovery my teeth problem. Dental health is every bit as important to dos as it is to humans. If you have a petsmart near you, they have grooming specials that include teeth cleaning. It is a good idea, but you can also purchase a pet toothpaste so that its teeth become more healthy and white as well. Dogs are very cute, so their teeth also look cute and healthy, You should collect information about healthy food for dogs. It's so much important subject and obviously we should to clean teeth properly. There are many ways for cleaning teeth. But keep in mind some tips. Such as first of all, you could Brushing Your Dog's Teeth, Dog Tooth Wipes, Dog Dental Treats, Natural dental sprays, Healthy/natural diet and much more. Actually here I got lots of information that really helpful and I think obviously these will help so much. And I'm also trying to share with you some effective ways for cleaning teeth. My last and final recommendation is you should go to a good dentist from knowing this matters accurately. Hopefully it will the best.